Tonight has to be in the running for the the highlight of what's been a hectic week. Amanda picked me up early from practice with the VMI mens soccer team, and we grabbed a quick dinner with some dear friends before dashing in to town to Rockbridge County High School (RCHS). The main event at RCHS was a football game against local rivals Perry McCluer. Principals from each school promised the crowd (and it was packed) that they would take the ice bucket challenge, if over $1000 in donations were raised during the first half. Amanda and I, along with another local ALS sufferer, Tammy Hamilton, and her husband, Jim, were contacted by Donna Wallace at RCHS about the plan about a week ago. Donna asked us all to witness the principals' dousing at half time on the field. We knew the event would raise awareness about ALS, so we immediately knew it was an event we had to attend. But then we were truly humbled when the organizers said that they wanted to give the proceeds to Tammy and I (they also took a portion and donated it to the ALSA). 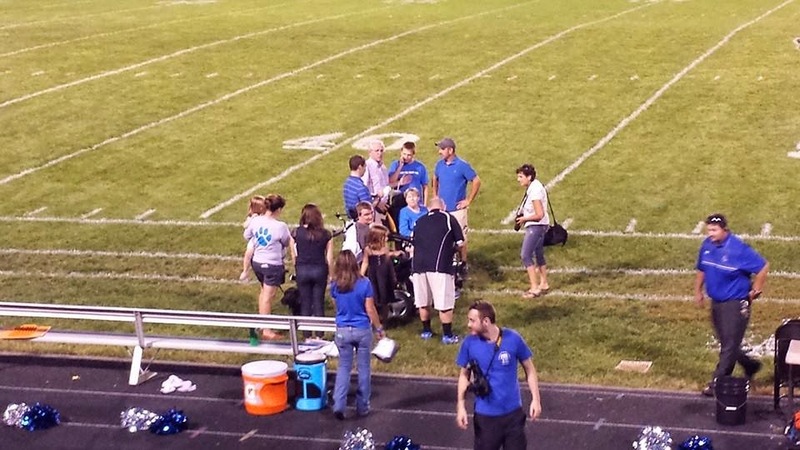 As we rolled onto the field, the announcer introduced us and other people from the community who have ties to ALS. The crowd rose and applauded, while the announcer proclaimed total donations of $2400. There was a cheer from the crowd as the total was announced. Of course, it wasn't hard to find students who wanted to douse their principal in ice cold water. With a quick countdown, the principals graciously took their cold showers. It was truly a special moment, and my family and I can't thank the local community enough for their support. Well done to all involved, especially the rival High Schools; RCHS and 'McCluer' but hey that's a strange way to spell McClure eh! Flying back to Glasgow on Sunday with a couple of days stop-over in North Wales to break up the journey North, so will have little, if any, internet access. Might be able to check in on the/my new phone, courtesy of my lovely daughter-in-law, if so, all good and well, if not, no worries pal, will catch up with you soonest........Love and respect to you and yours Tony, 'The Conways are up there with the best'......... For Sure! What's the big deal about kissing a pig? My wife's been doing it for over 30 years!